We have a new house (!) and there is boxwood in the front yard. 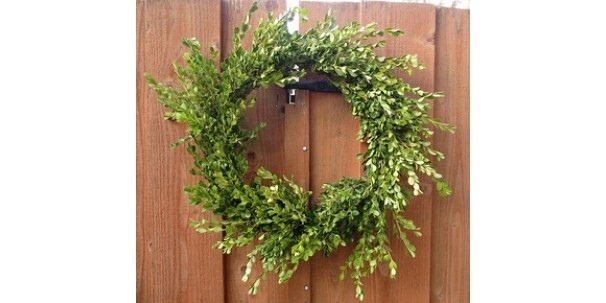 Since we moved in, I have wanted to do a boxwood wreath. I did it! And now you can too. Cut 50 – 60 20 inch lengths of wire. 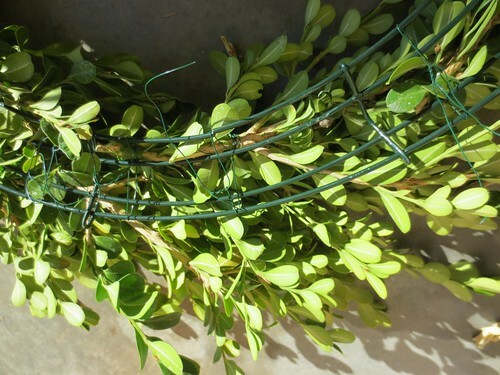 Organize the clippings into clusters and wire them together. Leave long tails coming from one side to use to wrap the clusters to the frame. Work on making clusters for a while. Then, begin twisting the clusters to the frame. Pick a starting point and work “backwards” from there. 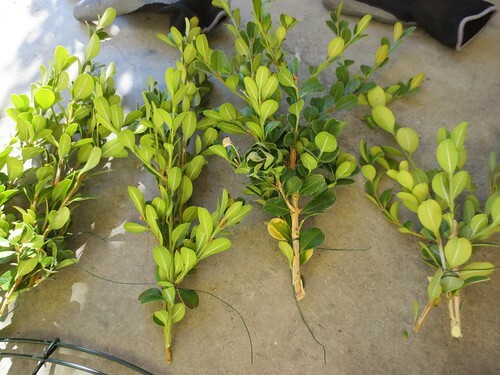 Lay your first cluster down and then make the bulk of the next cluster cover the stems and the wire from the first one. It will be easier ,and more stable, if the twisting wire is covering two or more of the frame wires. 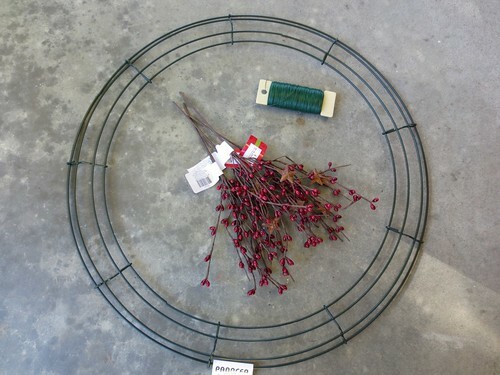 If you twist the tail wires around 1 wreath frame wire, it will be wobbly and off balance. But if you widen the two tails apart and feed them around two (or more) wreath wires, you will have a more stable hold. Here is a detail of the back of the frame. Carry on until you have gone all the way around. Trim as you see fit. And embellish as you see fit. I did neither in the end. I liked the rustic look. I thought it looked good a little fringey. And I liked it just green. A note: This did not last as long as I would have hoped. I thought that I could use this from Thanksgiving through Christmas. I planned to leave it green and then add the berried when I decorated the house for Christmas. In fact, it really only had 2 very good weeks. Then, the branches started to dry out and some of them yellowed on the ends. 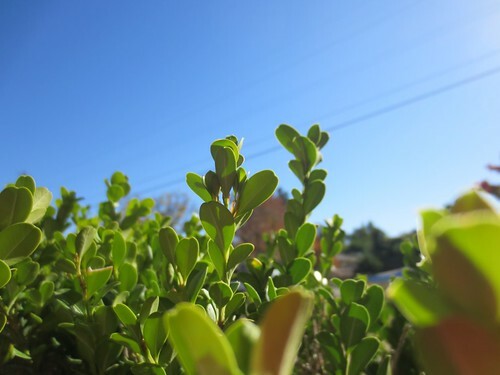 We are in Northern California where we enjoy warm sunny days almost all year around. So maybe the snow, and/or more precipitation would be better, and help it last longer. I’m not sure. But if you want to do one for yourself, wait until the last possible time to do it, so that it will be fresh for you in the peak of party season. 5 years ago by Susi in Christmas , Craft Projects , Holiday , Projects , Thanksgiving | You can follow any responses to this entry through the RSS feed. You can leave a response, or trackback from your own site. Since your wreath is unadorned, you might have been able to take it down and submerge it in water to make it last longer. As a note, when using fresh cuttings. Always keep them in a container of water while working. 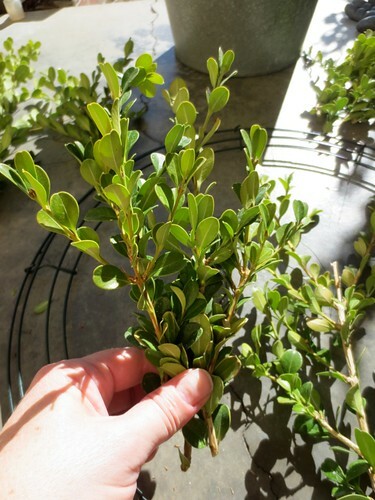 I was always told to cut the stems at a diagonal so that there is a larger surface area for the cuttings to absorb water. 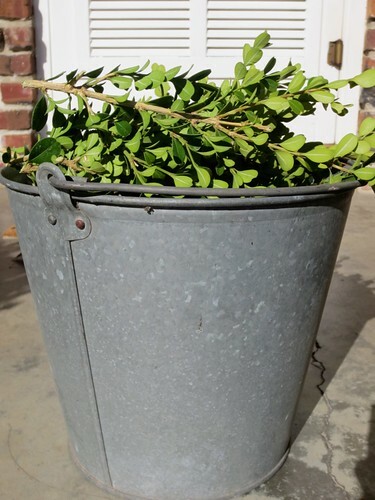 When I use clippings, I keep them in water overnight before putting them on a wreath/form. 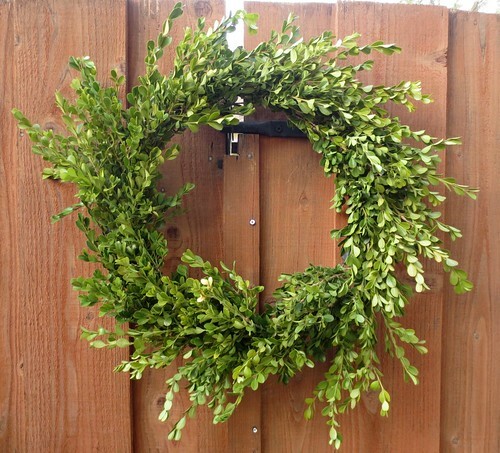 Also, you can spray your wreath with water to keep moisture on it saw well–only if you are using it unadorned. You did a great job and I hope this is one of many wreaths in your future.